2015 is already shaping up to be a big year in astronomy and planetary exploration, with the best yet to come. Here are some highlights to keep your eye on throughout the year. January 25 marked 11 years since the Opportunity Rover landed on Mars in 2004 just three weeks after its now inactive twin Spirit. This view is taken from the rim of the Endeavour Crater at a point known as Cape Tribulation. This is the highest point that the rover Opportunity has reached since it left the Victoria Crater area back in 2008. It has taken three years for the 180kg solar powered robot to complete the journey down to the Endeavour Crater, which measures 22 kilometres in diameter. One of its key mission accomplishments has been the characterisation of soft rocks and soil to provide evidence of past water on the Mars. Asteroid 39392 Opportunity was named after this hardworking rover. This animation of the dwarf planet Ceres was made by combining images taken by NASA’s Dawn spacecraft on January 25, 2015. Later this year in March, the NASA probe Dawn will arrive at the dwarf planet Ceres. Ceres is one of the largest known bodies in the asteroid belt. It is thought that favourable conditions for life may have once existed there, and the presence of water has recently been announced. NASA also recently released amazing results from the Dawn mission about the asteroid Vesta. This asteroid was believed to be dry, since it was believed that asteroids are incapable of retaining water. Yet the recent results provide evidence that Vesta may have had short-lived flows of water-mobilised material on its surface. These results make the asteroid very interesting as these characteristics were thought only to be present on planets. Who knows what interesting discoveries will be made with the upcoming rendezvous with Ceres? 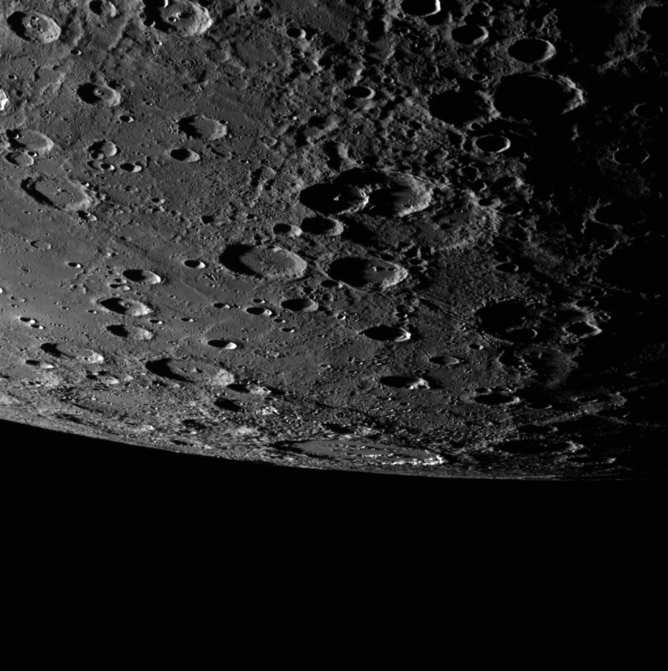 Alver crater graces this image of Mercury’s limb. Secondary crater chains that scour the surface and lead toward the top right of the scene appear to be from the Rembrandt basin to the north. The MESSENGER ((Mercury Surface, Space Environment, Geochemistry, and Ranging Mission) to Mercury was due to end in March 2015. Launched on August 3, 2004, it entered orbit around Mercury on March 17, 2011, for a one-year discovery mission, and has provided unprecedented views of the innermost planet. A manoeuvre on January 21 increased the altitude of its orbit, prolonging the mission for possibly another month. Sometime in late April, the probe will descend and crash into the surface of Mercury. 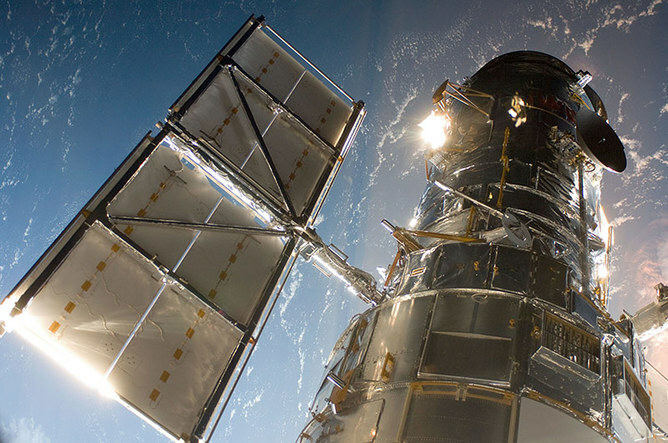 The Hubble Space Telescope in a picture snapped by a Servicing Mission 4 crewmember just after the Space Shuttle Atlantis captured Hubble with its robotic arm on May 13, 2009. The Hubble Space Telescope turns 25 on April 25, 2015. Launched into space on the Shuttle Discovery in 1990, and in spite of early problems and repairs over the years, it is still going strong. It is expected to continue through to 2018 when the James Webb Telescope is launched. 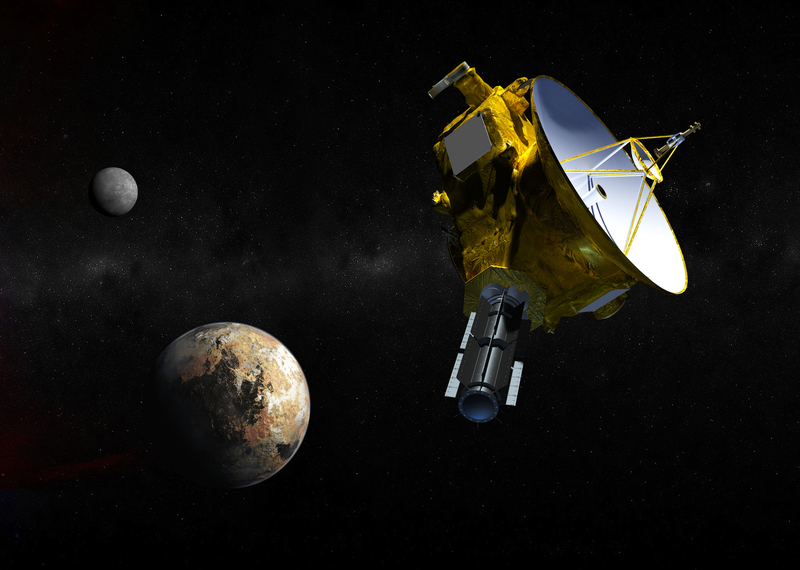 Artist’s concept of the New Horizons spacecraft as it approaches Pluto and its three moons in summer 2015. My favourite event will occur on July 14 when NASA’s New Horizons spacecraft flies by Pluto and Charon. The probe left Earth in 2006, just after Pluto was demoted to being a dwarf planet. It will provide us with the first up close and personal images of this outer solar system object. Initial observations started in January, but the best views will occur as it flies by the dwarf planet on July 14 before heading off to visit other objects far out in the Kuiper Belt. Mosaic of four images taken by Rosetta’s navigation camera on 22 January 2015 at 28.0 km from the centre of comet 67P/Churyumov-Gerasimenko. Rosetta successfully launched the Philae lander onto the surface of Comet 67P/Churyumov-Gerasimenko on November 2014 and continues to orbit the comet as it makes closest approach to the sun on 13 August 2015. 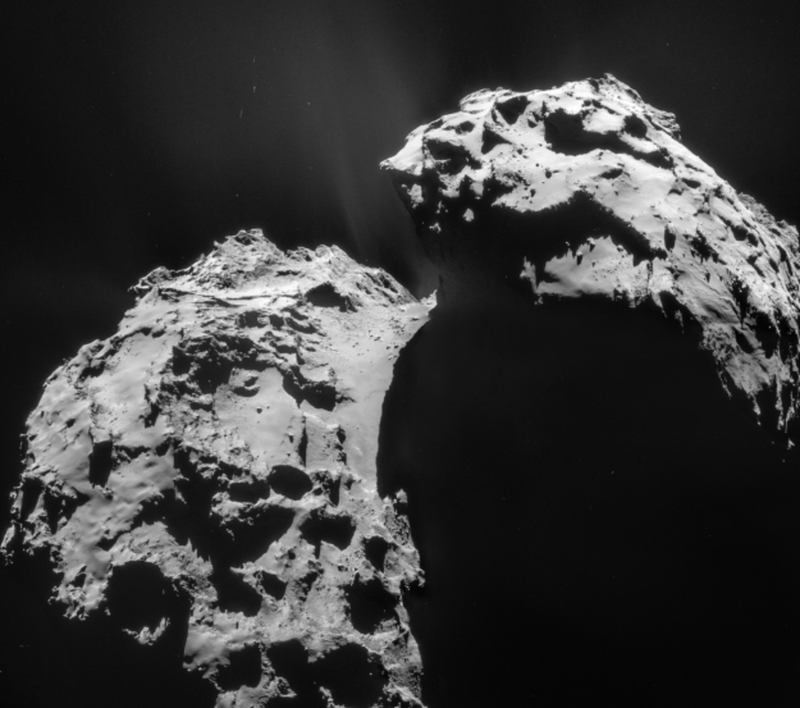 Rosetta’s mission is to monitor how the comet changes as it approaches the sun. It is hoped that the Philae lander, currently in hibernation, will wake up in the early months of the year as it gets more sunlight on its solar panels and again gather data. This view looks across the region of Enceladus’ geyser basin and down on the ends of the Baghdad and Damascus fractures that face Saturn. 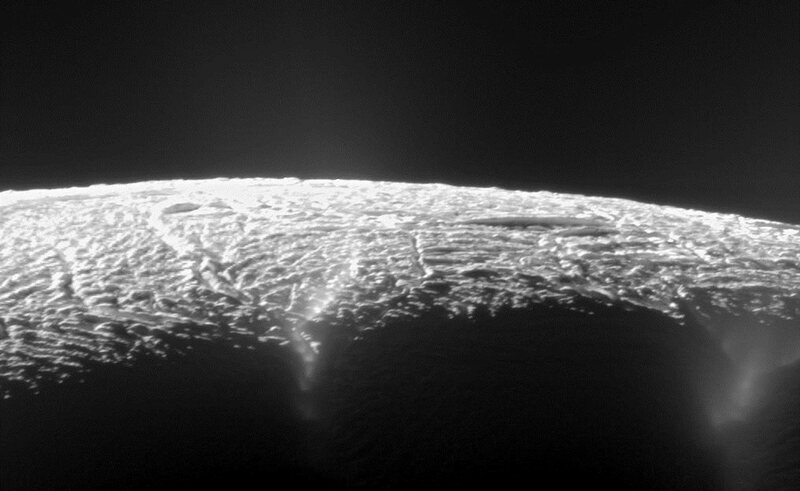 In October NASA’s Cassini mission is scheduled to undertake a close flyby of Saturn’s moon Enceladus. The flyby will allow the spacecraft to get close enough to fly through the geysers of water that have been discovered emanating from this very interesting icy moon and hopefully reveal secrets of a possible subsurface ocean. Artist’s impression of Voyager departing our solar system and entering deep space. 2015 will also see Voyager 2 follow its younger sibling out past the edge of our solar system sometime during this year. 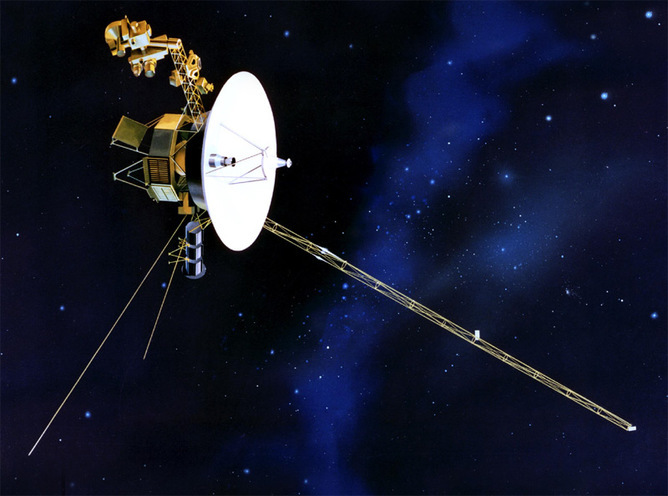 Both Voyager spacecraft were launched in 1977 and, with Pioneer 10, are now the most distant man-made objects in the solar system. While Pioneer 10, launched in 1972, has not been contactable since 2003, both Voyager probes continue to send information. This is just a snapshot of some of the highlights of 2015, which is sure to be a momentous year in space exploration.